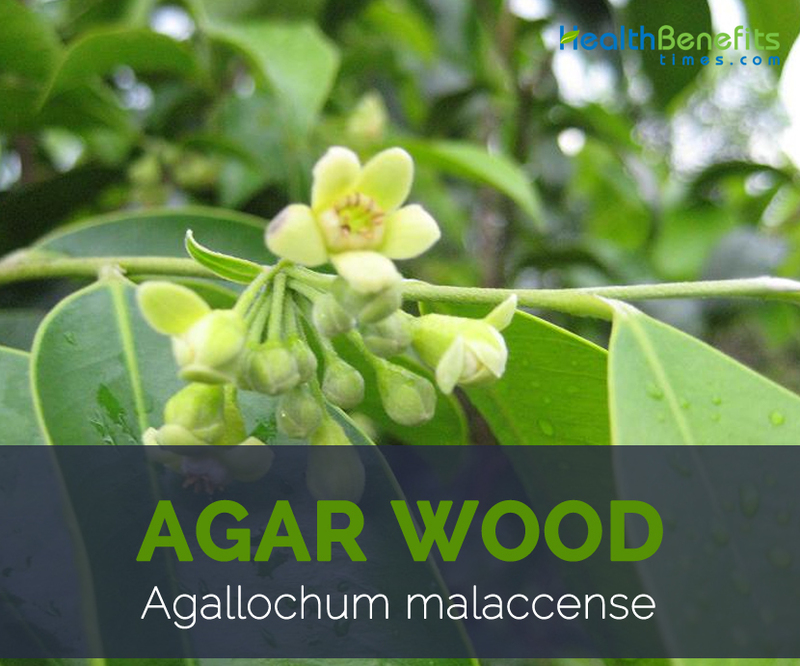 Agarwood scientifically known as Agallochum malaccense referred to as fragrance wood that’s utilized for producing perfumes, oil, incense or costly herbal medicine. It is also known as Agar Wood, Eaglewood, Ales Wood, Oodh or Agar, Gaharu, Aloeswood, Oud, Chen Xiang, Kalamabak and Jinkoh. 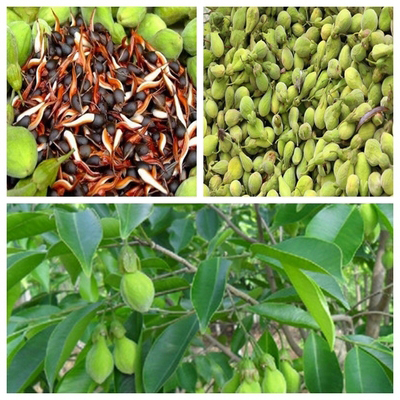 The Agarwood Plant is extensively available in Malaysia, Thailand as well as other country in South East Asia. Lately, more Agar wood is cultivated to meet international demands. From the historical viewpoint, more than 10 countries and regions are still growing or ever grew some certain species of Aquilaria tree. These countries are India, Vietnam, Thailand, Laos, Myanmar, Malaysia, Singapore, Indonesia, Cambodia, and China. In China, it is mainly found in areas such as Guangdong, Guangxi, Yunnan, Hainan, Taiwan, and Hong Kong. It is most expensive wood and used for a several things. Its resin and oud oil is used in Ayurvedic medicines and cosmetic products. The heart of the tree wood produces this dark aromatic resin as part of its natural defense mechanism when infected with fungus (Phialophora Parasitica). This resin can be produced either through natural causes of the wild or through the artificial means of inoculating it with resin-inducing substances. It is also broadly put into use as incense ingredients for cultural offerings or spiritual prayers. 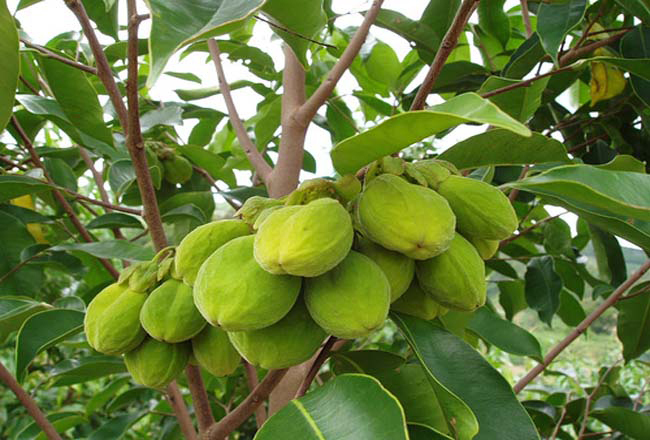 The heartwood of Agar tree has economic and medicinal significance. Agarwood is a common name of evergreen tree Agallochum malaccense. It is found at altitude of 1500 m above the sea level. In India, Agarwood is mainly found in East Himalayas, Arunachal Pradesh, Mizoram, Meghalaya, Nagaland, Manipur, Tripura and Assam. 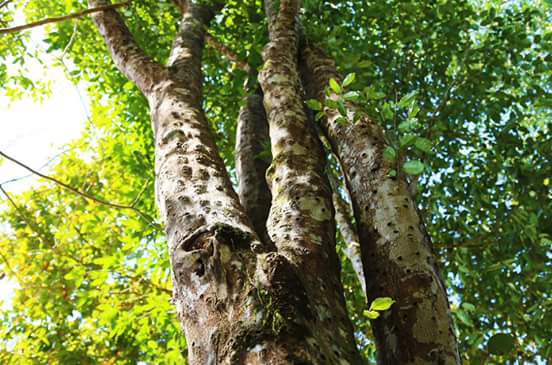 The heartwood of Agar tree has economic and medicinal significance. The plant is 40 m high and spreads up to 12 m wide and prefers heavy soils developed from gneiss and other metamorphic rocks, but it also grows well on sandy loams developed from sandstone. Plant has pale, thin and smooth trunk with smooth, whitish bark. Branchlets are slender, pale brown, pubescent, glabrescent. 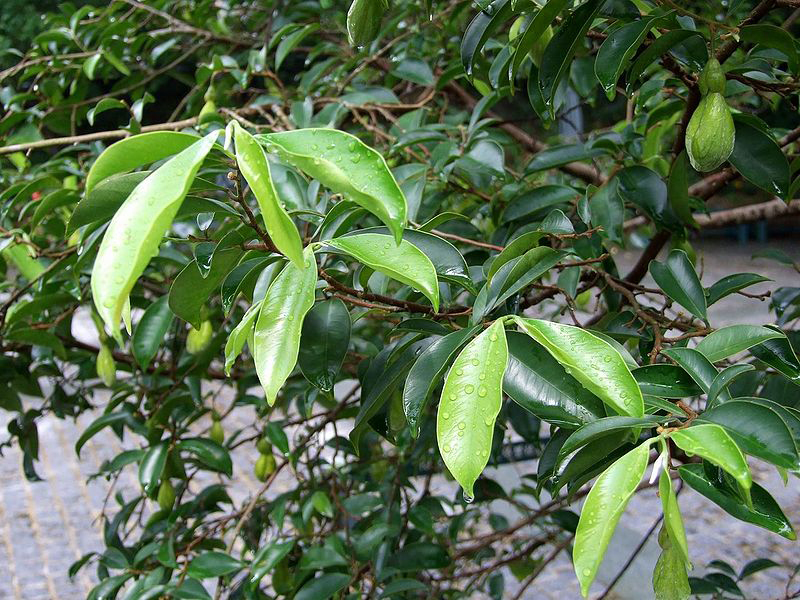 Leaves of the Agarwood are simple, alternate; petiole 4-6 mm long; blade elliptical-oblong to oblong-lanceolate, 7.5-12 cm × 2.5-5.5 cm, chartaceous to subcoriaceous, glabrous, sometimes pubescent and glabrescent beneath, shiny on both surfaces, base acute, attenuate or obtuse, apex acuminate, acumen up to 2 cm long; veins in 12-16 pairs, rather irregular, often branched, elevated and distinct beneath, curving upward to the margin, plane or obscure above. 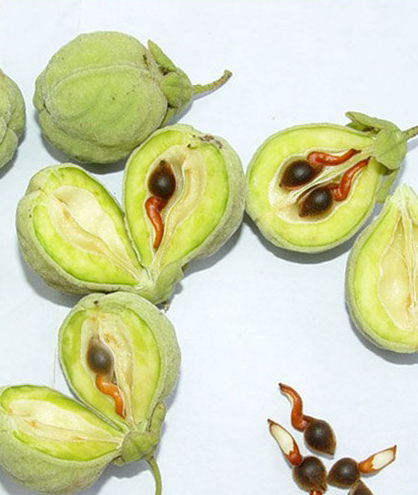 Fruit of the Agarwood is loculicidal capsule, obovoid or obovoid-cylindrical, 3-4 cm × 2.5 cm, usually compressed, pubescent, glabrescent, base cuneate, apex rounded; pericarp woody. Seeds are ovoid, 10 mm × 6 mm including a beak 4 mm long, densely red-haired, bearing from the base a twisted, tail-like, pubescent appendage as long as the seed. 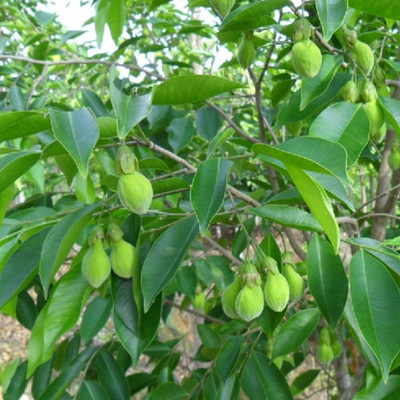 Agarwood leaves work as anti-depressants. Leaves consist of agarospirol which serves as anti-depressants. It helps to depress the central nervous system that causes tension and restore physical fitness. Agarwood leaves can also be as anti-aging skin. Agar wood leaf tea is used to remove mercury in the body, thus decreasing the risk of mercury neurological disorders and can prevent skin aging. When toxic mercury in the body can be removed with agar wood leaf tea, it makes skin healthy and free of blemishes or skin aging. Agarwood leaves helps to lose unwanted body weight. If you are overweight, you can consume the tea of Agarwood leaf. This has been proven to help you lose weight. You can consume six cups of Agarwood leaf tea every day to get the beneficial outcomes. Agarwood leaf can also soothe sleep disorders. Tea of Agarwood leaf, have effects that help to soothe and reduce the symptoms of stress, so that you can sleep calmly and longer. Agarwood leaves can also add energy. You can consume the tea of Agarwood leaf regularly. When you consume tea of Agarwood leaf regularly it helps to increase the quantity to urinate which shows that the Agarwood leaf tea works in the body. Flushing when detoxification occurs as a result of Agarwood leaf tea which also lubricates the stomach. Generally, Agarwood is used for reducing bad breath and mouth odor. Bad breath results from oral diseases and gum diseases in about 80% cases. In all these cases, agar resin works amazingly. It may not work if this problem is related with gastric issue such as chronic gastritis, acidity, heartburn etc. So in case of oral diseases you can consume Agarwood regularly for better outcomes. Body Odor: Take a stick of Agarwood. Rub it on a smooth stone with Milk or Rose Water. Apply this paste on the body before bathing. Fever: Boil a small piece of Agarwood (Agar) in 3 cups water in an earthen pot till it is reduced to half. Let it cool. Take One tablespoon daily for 3 days. Head Lice: Apply Agarwood (Agar) powder all over the affected area. Heartburn: Inhaling the smoke by burning Agarwood sticks will be beneficial to reduce heartburn. Liver Disorders: Breath in the smoke of Agarwood sticks. Acid Reflux: Agar ood (Agar) sticks are burnt and the smoke is inhaled. Vomiting: Burn some sticks of Agarwood (Agar). Inhale the smoke. OR: Prepare a decoction of Agarwood (Agar). Take one cup once a day. Nausea: Inhale the smoke by burning Agarwood sticks. Wrinkles: Grind Agarwood with Milk. Apply this paste everyday all over the face and body. For Skin: Make a paste of Agarwood by mixing Rose water. Apply over the affected part twice a day for half an hour. It will give an effective result. Scabies: Powder Agarwood (Agar). Add little water to make a paste. Apply it on the affected part twice a day for half an hour and then wash.
Itching: Grin dried Agarwood (Agar) with water. Apply over affected part for 20 minutes. 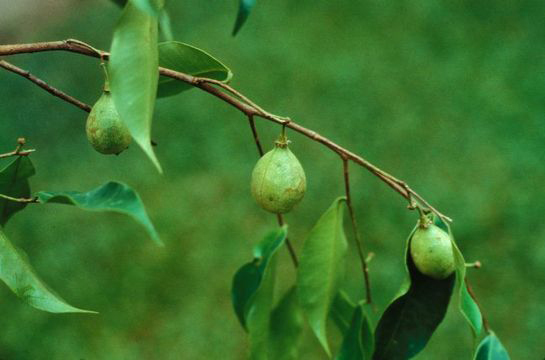 Elephantiasis: Mix Agarwood (Agar) powder with water to make a paste. Apply on affected parts twice a day for 20 minutes. Swelling: Apply a paste of Agarwood (Agar) on the affected part for half an hour. Rheumatism: Apply the gum of Agarwood (Agar) on the affected part twice a day. Asthma: Take 5 cups of Agarwood pieces. Boil in 2 liter of water until it reduces to 1 liter. Add 1 liter each of Cow’s milk and Gingelly oil to it. Boil the mixture again to remove the moisture completely from it. Take Terminalia Bellirica and Liquorice root powder each of them half cup. Add to the mixture. Let it cool, then strain and store. This oil can be used to massage the scalp twice a week. Leave it for 20 Minutes and then Wash off. Migraine: Boil 4 cups of Agarwood pieces in 2 liter water till it is reduced to One liter. Now again boil it with one liter each of Cow’s milk and Gingelly oil and remove its moisture. Add half cup each of powdered Terminalia Bellirica and Liquorice root. Let it cool then strain. Massage the scalp with this oil twice a week; keep it for 20 Minutes and Wash off. Swelling: Take 4 cups of broken Agarwood chips. Soak in 2 liter water over night. Next day boil it till the water is reduced to half liter. Now grind the chips separately and again boil with the decoction for 10 Minutes. Filter. Heat with half liter each of Coconut Oil and Cow’s Milk. Add One cup each of Wild Turmeric, Rinds of Terminalia Bellirica and 2 cups each of Cassia Auriculata and Southernwood flower. Add a pinch of Saffron. Boil for 10 Minutes. Cool, strain and store. Massage the scalp with this oil twice a week. Baldness: Dip 5 cups of broken Agarwood chips in 2 liter water overnight. – Boil until the water reduces to one fourth. Add half liter of Coconut Oil and Cow’s Milk, one cup each of Wild Turmeric, Rinds of Terminalia Bellirica and 2 cups each of Cassia Auriculata (Tarwar) and Southernwood flower. Boil for 10 minutes and Strain. Apply on the scalp twice a week. Blocked Nose: Take about 2 liters of water. Add 5 cups of Agarwood pieces. Boil it. Wait till the volume reduces to 1 liter. Add 1 liter of Cow’s Milk and 1 liter of Sesame Oil. Remove the moisture from the mixture by boiling it. Add 1/2 cup of Terminalia Bellirica rinds and Liquorice roots. Let it cool. Filter it. Use it twice a week. Body Odor: Take 2 liters of water. Add 5 cups of Agarwood pieces. Boil it. Wait till the volume reduces to 1 liter. Add 1 liter of Cow’s Milk and 1 liter of Sesame Oil. Remove the moisture from the mixture by boiling it. Add 1/2 cup of Terminalia Bellirica rinds and Liquorice roots. Let it cool. Filter it. Use it twice a week. Asthma: Take a Betel (Pan) leaf and wash. Drip 2 drops of Agarwood (Agar) oil over it. Chew it properly once a day. Cough: Powder dried Agarwood (Agar). Take one pinch with one teaspoon Honey (Shehad) twice a day. Hiccups: Put one pinch Agarwood (Agar) powder in one teaspoon of Honey. Mix. Lick it twice a day. Impotence: Pour 2 drops of Agarwood (Agar) oil on fresh Betel (Pan) leaf and take once a day. Excessive Sweating: Boil the Plum juice. Add all powdered Agarwood in boiling juice. Heat till the mixture becomes thick. Apply lukewarm mixture over the affected part once a day. Cough: Take Agarwood (Agar) and Aristolochia Indica (Hooka Bel) root in equal quantity. Grind them together. Add little water to make a paste and apply on the chest for half an hour. Anorexia, low appetite: Take 1-3 grams of Agarwood powder with honey. Puerperal disorder: Prepare tea of Agarwood and give in dosage of 10-20 ml. Snakebite: Apply the paste of Agarwood at affected body part. Agarwood is used to relieve spasms and to lower fever. 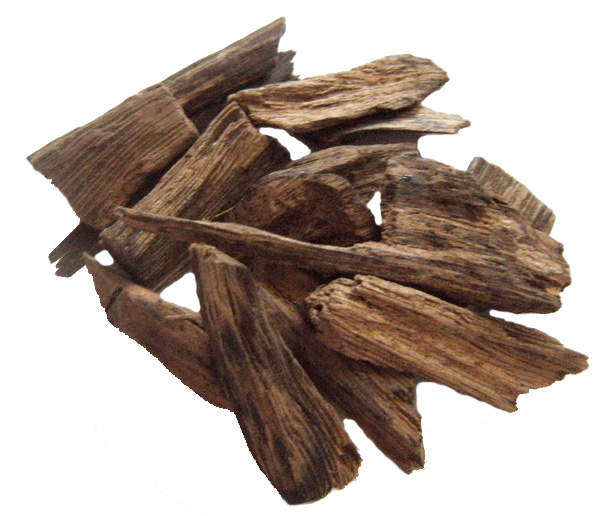 Agarwood is used as a sedative against abdominal complaints, asthma, colic and diarrhea in china. AGarwood also is an aphrodisiac and carminative. In Western, Chinese and Indian medicines the Agarwood incense is used against cancer, especially of the thyroid gland. Agarwood is applied as a sedative against abdominal complaints, asthma, colic and diarrhea, and as an aphrodisiac and carminative in China. Grated Agarwood enters into various preparations used especially during and after childbirth, and to treat rheumatism, smallpox and abdominal pains. Decoctions of the Agarwood are said to have anti-microbial properties, e.g. Against Mycobacterium tuberculosis and Shigella flexneri. Agarwood is a good herbal treatment for countering Throat related disorders like inflamed Throat, due to its, Analgesic characteristics. Agarwood is effectual in strengthening the essential organ Heart, and prolonging its functionality. Agarwood is quite beneficial for enhancing Sexuality. Agarwood is effective in countering affliction before and post childbirth. Agarwood is advantageous in preventing the condition of loose Stool like Dysentery and Diarrhea. Agarwood is also used in preparation of Creams, Lotions and Incense Sticks. Agarwood is effective in tending Muscular ailments like Spasm, often seen in Toes, Hands, etc. It helps in curbing the abrupt expansion and contraction of Muscles, group of Muscles or Organs. Agarwood also neutralizes Colic, which involves sudden generation and halt of pain, in the stomach. 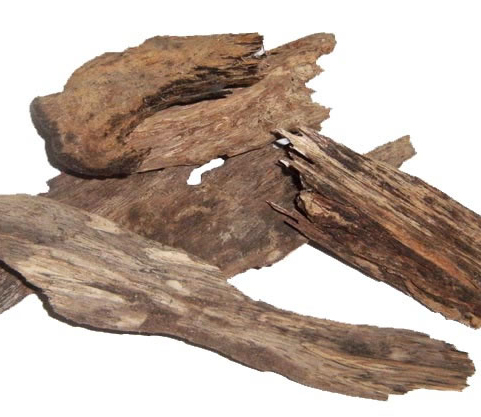 Agarwood, also known as oud, oudh, agar, aloeswood, gaharu, jinko or lign-aloes, is a dark resinous heartwood that forms in Aquilaria and Gyrinops trees (large evergreens native to southeast Asia) when they become infected with a type of mould. Prior to infection, the heartwood is odorless, relatively light and pale colored; however, as the infection progresses, the tree produces a dark aromatic resin in response to the attack, which results in a very dense, dark, resin embedded heartwood. The resin embedded wood is valued in many cultures for its distinctive fragrance, and thus is used for incense and perfumes. Agarwood is most expensive wood and used for a several things. Its resin and oud oil is used in Ayurvedic medicines and cosmetic products. Common Names Agarwood, Agar wood, Aloewood, Eaglewood, Lign-aloes, Indian Aloewood, Aloeswood, Agar, Akyaw, Sasi, Aloes Wood, Malacca eagle-wood. French: Bois d’Aigle, Bois d’aigle de Malacca, Bois d’Aloes, calambour. Borneo: Alas, Calambac, Ching karas, Gaharu, Galoop, Garu, Gharu, Karas, Kayu gaharu, Kekaras, Kepang, Laroo, Mengkaras, Ngalas, Sigi-sigi, Tabak, Taras gharu, Tengkaras. Indonesia: gaharu, ki karas (Sundanese), mengkaras (Sumatra). Branchlets Slender, pale brown, pubescent, glabrescent. Leaf Simple, alternate; petiole 4-6 mm long; blade elliptical-oblong to oblong-lanceolate, 7.5-12 cm × 2.5-5.5 cm, chartaceous to subcoriaceous, glabrous, sometimes pubescent and glabrescent beneath, shiny on both surfaces, base acute, attenuate or obtuse, apex acuminate, acumen up to 2 cm long; veins in 12-16 pairs, rather irregular, often branched, elevated and distinct beneath, curving upward to the margin, plane or obscure above. 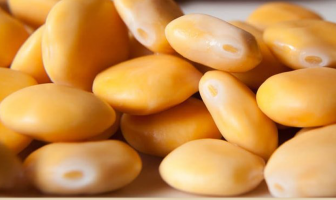 Fruit Loculicidal capsule, obovoid or obovoid-cylindrical, 3-4 cm × 2.5 cm, usually compressed, pubescent, glabrescent, base cuneate, apex rounded; pericarp woody. Seed Ovoid, 10 mm × 6 mm including a beak 4 mm long, densely red-haired, bearing from the base a twisted, tail-like, pubescent appendage as long as the seed. It is profitable in curbing and relieving stiffness in the Chest. It is advantageous in combating Skin conditions like Skin infection and helps in providing healthy and flawless Skin. 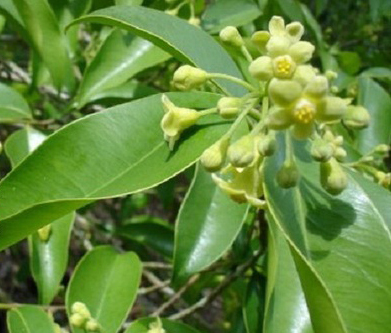 It also helps in countering Smallpox, which is transmittable and forms Blisters, filled with fluid. It is valuable in maintaining Blood Sugar Levels in our body. It is favourable in curing Respiratory troubles like Asthma, difficulty in normal Respiration and Bronchitis. It is fruitful in taking care of Lung disorder termed as Pleurisy, resulting in Swelling and Pain, in the Lungs. Agarwood is a good herbal treatment for counteracting Digestive disorders, resulting in Acid Reflux. It not only stimulates detoxification but also helps in keeping away ailments associated to the Digestive Tract. It is worthwhile in treating Anorexia, which is a condition related to disorder in eating habits and phobia of staying slim. It is suitable for curing Liver related troubles like Cirrhosis, whose outcome is Scared Liver tissues, with inability of functioning appropriately. It has Pain killing properties, which takes care of inflammation pertaining to Abdomen, Joints or any other parts. It is beneficial in curbing Rheumatism, which involves extreme Pain and Swelling in the Joints and tissues connecting them. It is Diuretic in nature, which in turn helps in stimulating the proper flow of Urine and keeping away Urinary afflictions. Seeds and bark is used to flavor curries. The incense also functions as an insect repellent. 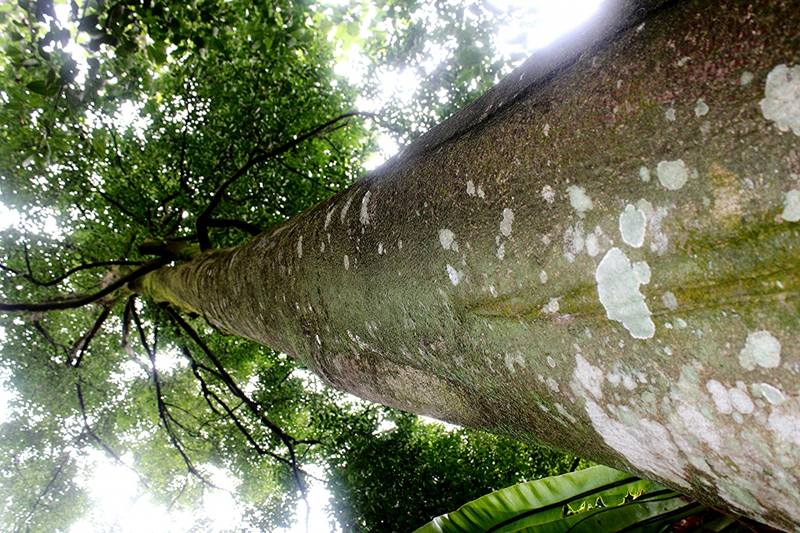 The inner bark is used in making cloth, ropes, and writing materials. The timber of healthy trees is used for making boxes, in light construction, and veneer. Aquilaria agallocha Roxb. ex DC.